Three years ago, Sydney Salomon was sitting in her freshman religion class listening to student companions share their personal stories as part of the Imagine Grief Education Program at Union Catholic. Salomon was so inspired by the experience that she decided she wanted to help other students, so she became a student companion. On Monday, Union Catholic began its Imagine Grief Education presentations, which will run through Thursday at the school. In addition to Salomon, the Union Catholic student companions are Anna Rosenzweig, Jacob Jusma, Korantema Cofie, Calah McCombs, Meaghan Mulvanerty, Sean Machado, Michael Robateau, Christopher Robateau, Alyse Moss, Kiara Renteria, Myaya Morton, Rebecca Penevolpe, Julie Emmons, and Adrienne Caceda. The student companion educators at Union Catholic are Sean Machado, Yilin Chai, Aiyana Williams, and Dylan France. Union Catholic has partnered with Imagine, A Center for Coping with Loss in Mountainside, on the Grief Education Program. The program held a #Here4u Companion Training session with Mrs. Connie Palmer from Imagine earlier this month to prepare students for their presentations and their role as companions. 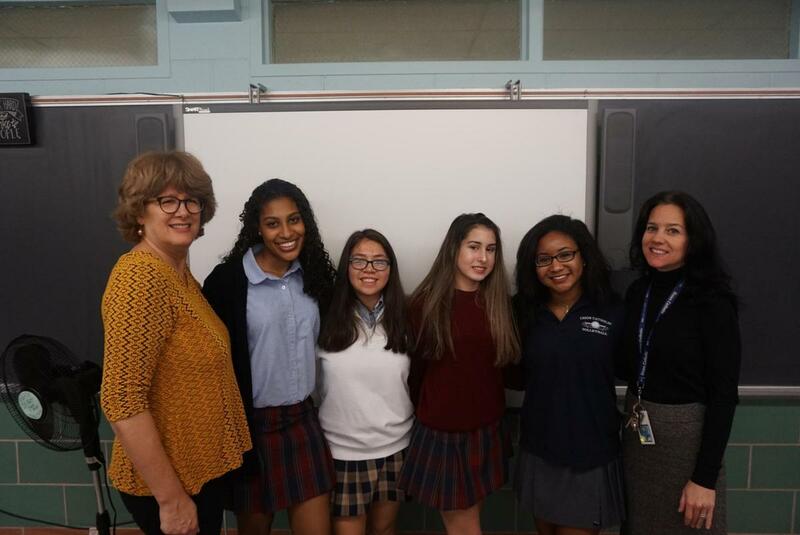 Mrs. Palmer, the Clinical Training Director at Imagine, began the thought-provoking presentations in religion classes before the student companions courageously shared their personal stories of grief and resiliency. Mrs. Palmer explained the different forms of grief, which ranged from death, divorce, adoption, and sports injuries, and spoke about how to deal with grief, how to talk to someone who is grieving, and how to help yourself and others throughout the grieving process. Mrs. Palmer said Union Catholic’s growth since the inception of the program is very encouraging and stems from the culture that the school has created. Salomon said it’s very gratifying to know that she’s now helping others. Salomon is grateful to Union Catholic for beginning the Grief Education Program. Mrs. Jennifer Dixon, the Director of School Counseling at Union Catholic, praised UC Principal Sister Percylee Hart for supporting the #Here4U program, and the UC student companions for sharing their stories. Any student who is interested in becoming a companion through the "#Here4U program" or who would benefit from the support of speaking with a student companion should contact Mrs. Dixon.